You probably already know about mountain ash trees. They’re all over Southeast, known for their red berries that attract flocks of birds. 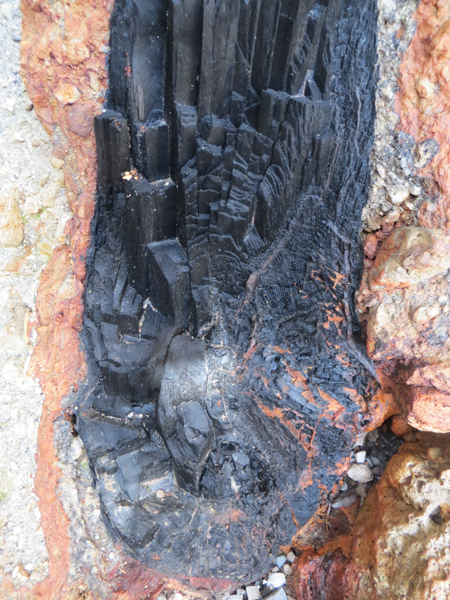 Here’s a story about a different kind of ash tree, one recently discovered in a big pile of volcanic debris. Forest Service Geologist Jim Baichtal samples the charcoal tree found embedded in pumice on Kruzof Island, near Sitka. Photo courtesy of Kitty LaBounty. Word came late summer of an unusual natural relic found by a young Sitkan, Blake LaPerriere. It was near the Mount Edgecumbe Volcano, just west of the Southeast city. So a group of scientists and friends headed out for a look. University of Alaska botanist Kitty LaBounty says it was a scramble. “They led us through this pile of logs, back up into a creek area where the bank had been cut enough away that you could see this pretty amazing tree,” LaBounty says. What they found was upright and largely intact. But it wasn’t petrified. “It actually looked like a tree. Like a charcoal tree. And when you looked at it up close, you could all the structure, see where some of the roots were, some of the branches, you could see knots actually still in the structure of the tree,” LaBounty says. It was embedded in pumice, an extremely porous rock created during explosive volcanic eruptions. Now, you may know pumice as a rough, granular stone sold as a cosmetic and used to scrape away dried skin. 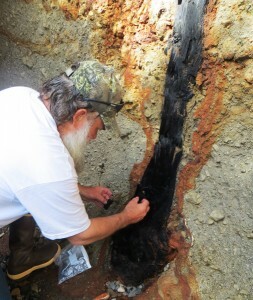 Geologist Jim Baichtal says this pumice fell as powder, grains and rocks. And it quickly buried the tree. 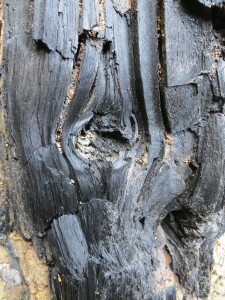 More details of the charcoal tree. Photo courtesy of Kitty LaBounty. “It was so hot that it basically completely charcoalized the tree in place,” Baichtal says. And it didn’t fall apart because it was held in place by the pumice – until now. “From the geology point of view, the exciting part is this is the first time we’ll be able to directly date that eruption,” he says. Baichtal says the volcanic material came from Crater Ridge, one of several volcanic features near Mount Edgecumbe. He’s sent off some pumice and charred wood, plus a small piece of obsidian, a dark volcanic glass, that will help date the eruption. “We’ve got enough samples that we can get the chemistry of what the eruption was. And that will tell us too because each of those individual vents has a slightly different chemistry,” Baichtal says. Baichtal says the information will be added to existing research on the volcanoes of Kruzof Island, where Crater Ridge and Mount Edgecumbe stand. Structural details can still be seen in the charcoal tree found near Sitka. Photo courtesy of Kitty LaBounty. Scientists already know the massive weight of ice-age glaciers, which used to cover most of Southeast, pushed down the region’s landforms. As they melted and retreated, that land rose back up. “And we’re thinking that the eruptions are tied to fractures opening and closing with the warping of the Earth’s crust at or soon after deglaciation,” Baichtal says. The region continues to see shrinking glaciers and thinning icefields. But Baichtal says it’s not on a large-enough scale to expect eruptions anytime soon.